TROY, NY—The city of Troy, NY (population 50,129), is just a few miles upriver from the state capital of Albany and is known as the birthplace of Sam Wilson, a meatpacker on whom the iconic image of “Uncle Sam” is based, as well as home of the prestigious Rensselaer Polytechnic Institute (RPI). Click photo to download. Caption: Congregation Berith Sholom of Troy, NY, the Empire State's oldest continually occupied synagogue. Credit: Paul Foer. Troy (surprisingly not New York City) is also home to the oldest building in continuous use as a synagogue in New York, and that’s quite a superlative considering that New York has for some time been home to the most Jews of any U.S. state. However, you might not recognize the Reform Temple known as Berith Sholom when approaching it from the outside on the quiet corner of Third and Division Street. You’ll see a red brick building with steps leading up to large double wooden doors topped by stained glass windows. There is a small black sign with white lettering. It could be an old church but it soon becomes evident that this is not a church at all, but an old and still very active synagogue. The building dates back to 1870, and in some respects this house of worship reflects changes in the Jewish community from that time. 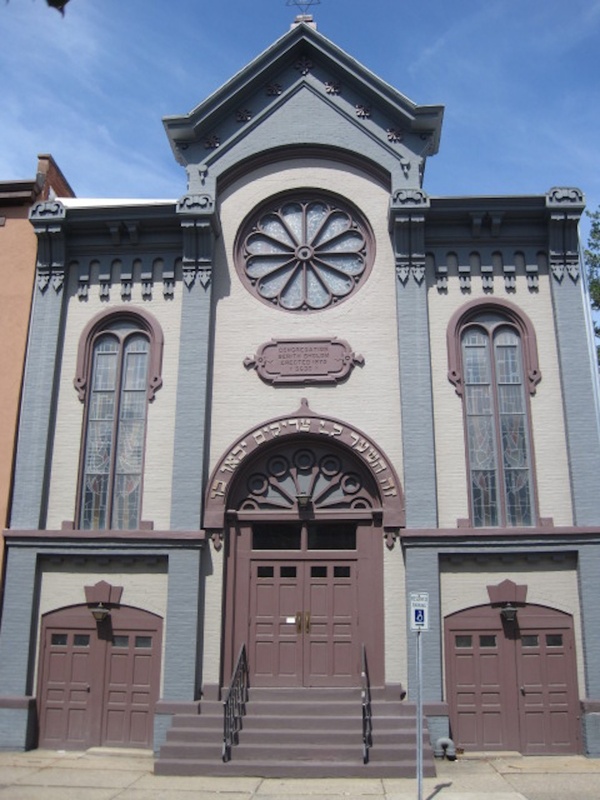 In 1866, just one year after the Civil War ended, residents of Troy met to incorporate themselves as the “Religious Society and Congregation of Baris Shalom in the City of Troy.” Previously they had met to conduct services and burials, but in June 1870 the cornerstone was laid, and the synagogue opened for services for the High Holidays a few months later. It joined the Union of American Hebrew Congregations, now the Union of Reform Judaism, in 1920. Today, the congregation’s 160 or so member families come from as far away as Saratoga and the Massachusetts/Vermont border. Click photo to download. Caption: Inside Congregation Berith Sholom of Troy, NY. Credit: Paul Foer. Samuel Rezneck, professor of history at RPI, wrote that the first Jew to settle in Troy was Barnet Levy, a tailor, in 1837. Emanuel Marks and others followed him in 1842, and there were perhaps 30 Jewish families by 1864, when Troy’s population was thought to be around 40,000. The commandant of the military arsenal across the river at the start of the Civil War was a Jew named Major Alfred Mordecai. Whether one calls the congregation liberal, reform, assimilationist or progressive, the architecture of the 142-year-old building has a number of unusual features. Its ark is reminiscent of a boat, designed to memorialize a congregant and college student who had drowned in a boating accident on the nearby Hudson River soon after the synagogue was built. The ner tamid, or eternal light, remains fueled by gas rather than electricity. The synagogue’s stained glass windows with images of the prophets were completed in 1965. Two women serve as co-presidents, the incoming co-presidents are both women, and the synagogue has a 30-year history of female rabbis that includes its current religious leader, Rabbi Debora Gordon. Gordon, known by many as RebDeb is an openly identified lesbian who lives on a producing farm with her partner and four adopted children. She joined Berith Sholom in 1997 as her first pulpit after rabbinical school at Hebrew Union College’s Jewish Institute of Religion. The 49-year-oldrabbi expressed her hope that Berith Sholom would be her first and last pulpit. 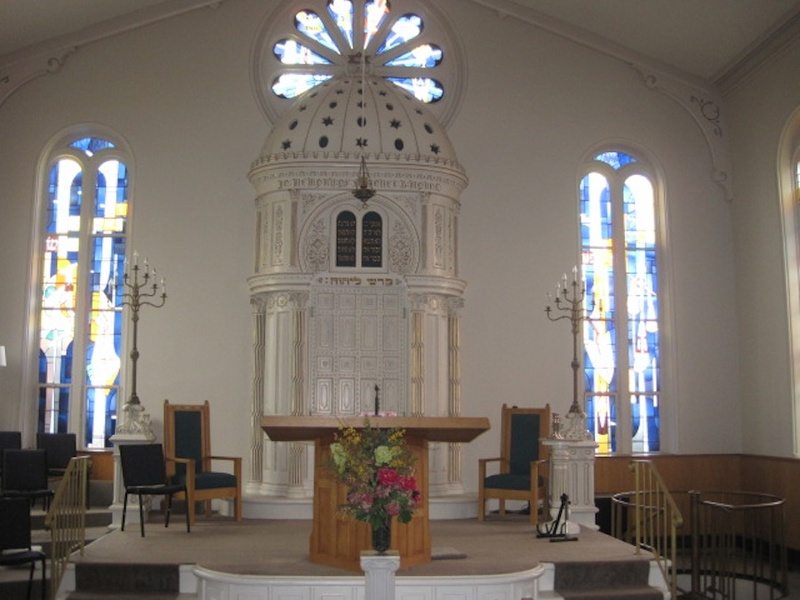 The synagogue holds an average of nine bar or bat mitzvahs a year, for both youth and adults. A soloist is hired to play the organ for the High Holidays, and Rabbi Gordon also sings and plays guitar. The synagogue holds Hebrew and Sunday school as well as conversion classes, and it is starting daytime Torah study. While there are older congregations nearby in Albany, they have moved from their original locations. “I really have the benefit of longevity, stability…I think that with any organization that’s been around a long time, some of the kinks have been worked out,” said Gordon. A few years ago, a long-range planning process asked the congregation if its members should look for a different location. “Even with no parking lot and little nearby parking, there was an almost unanimous sentiment that this is where we belonged,” Gordon said. Gordon’s farm is a 13-minute drive away in Brunswick, just to the east of Troy, where her goats produce milk and cheese and chickens produce eggs. In the morning, the rabbi raises her flock of animals, as well as her four children between ages 7 and 14, who were adopted through foster care. In the afternoons and evening, she tends to her flock at Berith Sholom. Of all the things going on, one that most excited Gordon is her congregation’s involvement with the annual “Victorian Stroll,” a December holiday tradition that attracts 20,000 to downtown for festivities. Berith Sholom opens its doors for a choir performance drawing between 75 and 125 people. Although the “Stroll” appears to be very much a Christmas as well as shopping event on the surface, the participation of the synagogue, which is a bit off the beaten path, cements the congregation’s longstanding position as an important member of the greater community. Posted on October 23, 2012 by Paul Foer / JNS.org and filed under Features, Travel and tagged Travel.